On Monday, BET found itself in the midst of a social media scandal when one of its employees decided to use their official Twitter account to throw shade at outspoken rapper Nicki Minaj. Was the caption tasteless, mean-spirited and completely unprofessional? Absolutely. Regardless of what you think about Minaj’s antics, her talent, and track record alone deserve more respect than that. 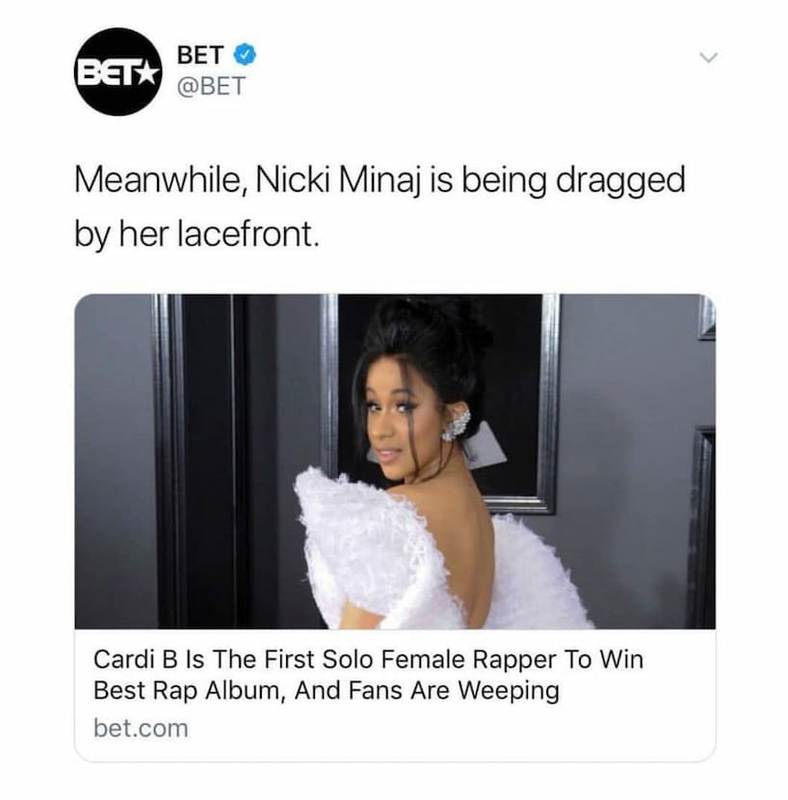 Which is why shortly thereafter when news broke that both Nicki and her camp at Young Money, decided to back out of headlining a show leading up to the 2019 BET Awards, not only was I not surprised, I also agreed with her indignation. After an afternoon full of backlash, Monday evening, the network released a statement apologizing to Minaj. And “address the situation” they did by reportedly terminating the individual responsible for the post. At this point I was proud of Minaj. Her post simply stating, “Young Money will no longer be apart of the BET Experience or award show,” was tactful, to the point, and had me feeling like her days of messy internet beefs were truly behind her. HOWEVER… it seems my joy about her newfound discernment was short lived, because the next morning, my colleague, who was justifiably upset, informed me that not only was Minaj back to her Twitter finger shenanigans, this time she’d gone too far. Minaj posted the picture and Twitter handle of the employee behind the caption; a clear signal to her most fanatical followers, known as Barbz, to gun after the person. Within hours these Barbz, infamous for investigative skills that would marvel even the C.I.A, had already figured out and made public this young woman’s social media handles, email and home address. HER ADDRESS y’all. As in the thing used by mentally unstable people to roll up on folks and cause them bodily harm. As my colleague went into a passionate rant about how this was tantamount to domestic terrorism and that if God forbid anything actually happened to this woman, her blood would be on Nicki’s hands. For once, always the devil’s advocate, I had absolutely no pushback. She’s right. There is simply no excuse, for anyone, particularly someone of Minaj’s social standing and audience reach, to ever, weaponize their fanbase in order to attack a member of the general public. Beyonce is attacked just as much as Minaj and arguably has an equally fanatical group of followers at her disposal. Can you ever imagine her one day releasing someone’s information on social media in retaliation? That response is so ridiculous and over the top, that if she ever did, our minds (and her credibility) would explode. And with good reason! In fact, outside of hip-hop culture, the only other person we know, who has such a repeatedly nasty habit of attacking private citizens on Twitter whenever their ego gets bruised…. is the 45th President of the United States, Donald Trump. A little Trinidadian girl from Queens, NY, who may very well be one of the best female emcees of all time, has now convinced herself that it’s OK to act with the same vitriolic lack of decorum as the President. Somehow, the outspoken, self-professed women’s empowerment advocate, who is always lamenting about how she’s marginalized, disrespected, and disproportionately maligned because of her Black womanhood, just sent millions of internet goons (with a lot of free time on their hands) after another Black woman. Over one shady tweet. Like, are we serious right now? Is that how low the bar has become? This is no longer about ‘Are you Team Nicki or Team Cardi?’ This is about engaging in blatantly reckless and potentially damaging behavior that could get someone’s daughter to get hurt. And what’s worse is, it isn’t even her first time doing this. While the tweet wasn’t exactly complimentary, it echoed the sentiments of many people aching for a Nicki evolution. This was constructive criticism and was nowhere near what would constitute hate speech. Yet, when the rapper caught wind of the tweet, she responded by sending not just one, but two, vulgar and hateful direct messages, calling the young woman “ugly” and urging her to “Eat a d**k” amongst other vile and immature things. After Minaj went on the defense and publicly doubled down on her sentiments, her Barbz, once again took her cue and went out of their way to make Thompson’s life a living hell. Although a smattering of users – who were unafraid of the Barbz – began tweeting messages of solidarity during the height of the cyber abuse, using the hashtag #IStandWithWanna, Thomspon later confessed during an interview with Mic that she was left feeling depressed and “exhausted” by the harassment. Social media is a platform used for self-expression and whether some of us want to admit it or not, celebrities are human beings with feelings. Sometimes, they can get wounded (or messy) just like the rest of us. But with great power comes great responsibility, and I fear what message Nicki Minaj is sending to her young and impressionable fans by continuously using them as toxic pawns. Rap and hip-hop culture, in general, are steeped in bravado and verbal warfare; I get that, but the beef has always largely been for theatrics. THIS, however, is cyberbullying on steroids, with real-life victims and possibly deadly consequences. I sincerely hope it doesn’t take that happening for her to stop.